Toby's brother Peter has become a terrible tyrant. Suspicious of the return of his long-lost brother, whose rightful inheritance also controls the lockstep hibernation cycles, Peter sees Toby as a threat to his regime. Now, with the help of a lockstep girl named Corva, Toby must survive the forces of this new Empire, outwit his siblings, and save human civilization. 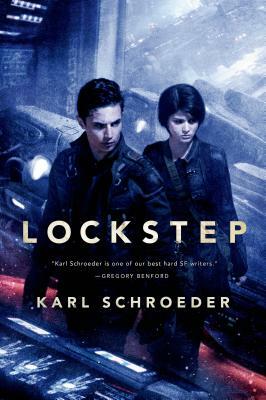 Karl Schroeder's Lockstep is a grand innovation in hard Science Fiction space opera. KARL SCHROEDER lives in Toronto, Ontario. He is the author of "Ventus "("New York Times "Notable book for 2001), "Permanence" (winner of the 2003 Prix Aurora Award for best Canadian SF novel), "Lady of Mazes, " and the Virga Series, beginning with "Sun of Suns."